I perked up at this quite a bit. I– hasn’t been the most voracious reader yet so him choosing this is heartening. AND, he picked Lloyd Alexander’s great Prydain Chronicles. For me, this series helped open up a whole world of reading. I bought the second book, The Black Cauldron, through one of those Scholastic book sale flier things the school would send home. I was in third-grade. I started reading it, realized I was lost and learned about series where the books are connected, not like Baby-Sitters Club where I could read out of order. 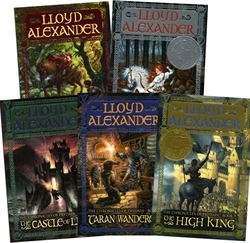 Lloyd Alexander’s books led me to lots of other things. It was a pretty short jump from there to Madeleine L’Engle. The Hobbit wasn’t far behind. I re-read the Prydain books multiple times. For some school project where we had to write a letter to an author, I sent one to Mr. Alexander. He sent back a helpful pronunciation guide to all the Welsh names. My best friend had the similar thing happen for her with the Alexander books. We’re both pretty excited for I–, that this will help unlock a world of reading for him the way it did for us.